The VT100…I wouldn’t miss the third weekend in July for the world. 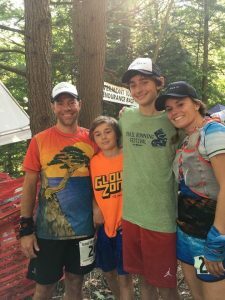 My family and I have been coming to the VT 100 since 2000, and it is one of the main reasons we live where we do today. In the early years, I was a horse girl through and through. I remember walking by the runners as I led my horse to the vetting area… in complete awe of what they were about to embark on. A hundred miles! Can people seriously run that far? I was giddy about taking on the challenge of my first 100 alongside these crazy ultra people. 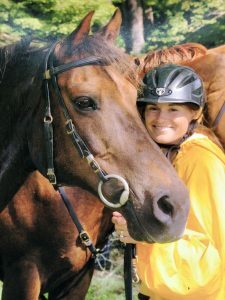 For most of the VT 100’s, I was aboard my beautiful Morgan horse, Song. I always compared him to riding on a couch, he was that comfortable. He was smooth, all business, and was a bit of an underdog, in the sense that he didn’t look the part. He was a bit portly as some would say, but he had a huge heart and I have some of my fondest memories on him at the VT100. He took care of me as I did for him, and we were a perfect team. 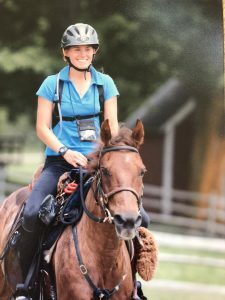 As a rider, you are constantly managing and worrying about your horse; are they eating, drinking, how’s their heart rate, hydration, soundness…hmmmm, I’m sure that sounds quite familiar to all you ultra runners out there. The sports are so similar, in that you can have a crew who follows you around from hold to hold or aid station to aid station (thank you… I couldn’t do my races without you, you know who you are). The one thing the horses have to do that the runners don’t, is pass a lameness and metabolic check by a veterinarian (I was glad I didn’t have to jog for Docs after the finish of my first 100). I’ve completed eight VT100’s on horseback, winning it back in ’04 while I was four months pregnant with my youngest son, Jase. That day was pure magic, meandering through the VT hills, cantering through the fields, and seeing my husband Guy and our two year old son, Justin, at every hold and fly-bys was so uplifting for Song and I. Brings tears to my eyes thinking back to it. Fast forward to 2015. A terrible horse injury brings my riding career to an abrupt halt. After the horse kick left my right elbow joint a fractured mess, I underwent three surgeries in less than a year, to repair it. I also suffered from a bit of PTSD from the kick, so I was left with the question…what now, who or what am I without riding? I had lost my mojo for riding, but needed to somehow feel that endurance flowing through my veins. I then turned to running to fulfill that fire. Running became my savior, healing me from the inside out with every mile. It’s funny how a person can truly reinvent themselves after an unfortunate event. Running allowed me to still feel the trails, feel the wind on my face, feel the connection to nature, feel all the feels of life. Finishing the VT100 on foot last year was one of the best feeling in the world. I toed the line with 350 incredible humans, including my wonderful husband and got to watch many of my friends on horseback fly by me at mile 8. 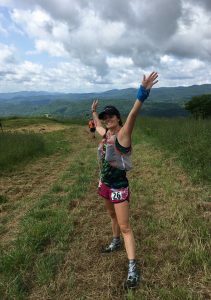 It certainly was not easy, there were many highs and lows throughout the day, but I tried to pull strength from the horses who so giftedly carried me eight hundred miles of the VT trails and back-roads. When my boys met me at mile 99.5, the tears were flowing big time, I can still feel the hugs on my back. 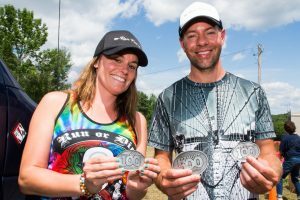 I think the VT100 is a such a special event, more than just a race. It will teach you about yourself, humble you, make you feel invincible, humor you, make you cry, make you feel all the feels. 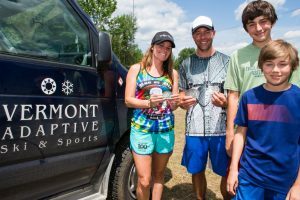 As you run, ride, crew, volunteer or spectate, you can’t help but think of why this event was started and who the event helps Vermont Adaptive Ski and Sports are changing the lives of the folks they help, giving them hope and the gift of sports. She makes some pretty awesome jewelry to fuel your soul and body butter and lip balm to soothe your body.